Painter, printmaker and designer, Stevie Howell loves many mediums. But it’s her role as textile designer that has her layering all three to give her work a distinct twist. Merging handcraft with digital techniques, this native San Franciscan experiments with color and shapes, contrasts and layers. The result is simultaneously organic and otherworldly. A former student of both the Glasgow School of Art and the School of the Art Institute of Chicago, Stevie’s aesthetic is modern and sublime. Whether she is designing wallpaper or a silk robe, Stevie strives to create colorful pieces that connect with people and bring joy to their lives. 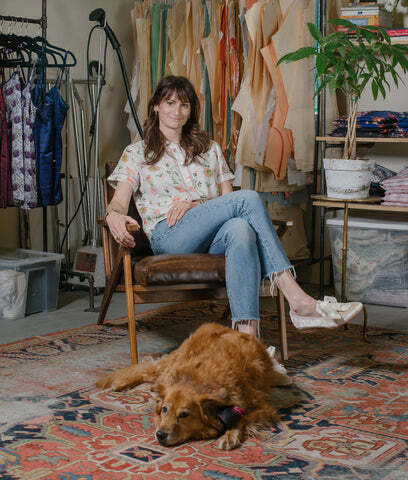 From a trip to Brazil to the weeds behind her studio, she lets life’s big and not-so-big moments inspire her to make the ordinary a little less so. The heart of each Stevie Howell piece lies in our prints. Robe, pajama, scarf, or pillow, each piece begins as original artwork painted in our studio in Venice, California. The creations are then manipulated into unique patterns and designs, making each item truly a wearable piece of art. From textile creation to final production, we aim to be as sustainable as possible. To minimize excess and waste, our products are manufactured in the US, India, and Uruguay in small batches. All our of textiles are printed using water-based inks on natural fibers and humane silks. And in Uruguay, we proudly worked with the World Fair Trade Organization to source extra fine merino wools and natural dyes.